One year I picked them off and put them in water and felt so bad about it. Instinct told me that something could possibly benefit by leaving them. We now leave them. The bushes are not good to look at and certainly not nice to be around. 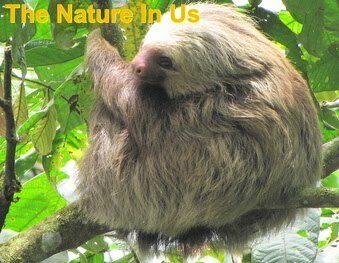 They last 4-6 weeks with an interest in about 300 species of plants. Fortunately for us, they seem to congregate mainly on the Rose of Sharons. My friends and neighbors have tried sprays and the bags that you hang around the garden to collect them, but their bushes don't appear to look any better than ours during this time period. The beetles release a substance that attracts more beetles and these bags have that substance in them. However, I've read online at various places that the bags seem to attract more beetles than they collect, so they're mostly being promoted now by places that sell them. Rather than let the beetles have their way, I pick them off my beans and raspberry plants and drop them in a weak solution of soapy water. Beetles, like ants, leave pheromones to attract more of their kind. 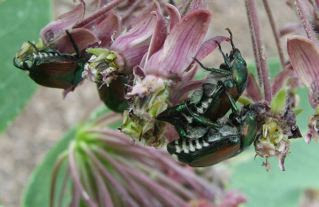 If you pick them off as they come, there are fewer beetles that follow, due to less of a pheromone trail. I also spread milky spore powder in my lawn, which attacks and kills the grubs. They don't seem to bother my roses or my rose of Sharon, as long as the pole beans are growing nearby. That's what I did the last year we had them (the soapy water) but it really grossed me out to do that and I felt so guilty! LOL I have noticed that there are lots of holes in the yard about the time they begin making their way to the surface. We have skunks and they seem to love digging for them and I have seen the raccoon digging also and have heard that opossums eat them too, so I'm sure they've been helping out. One point you make is about the pheromone trail. 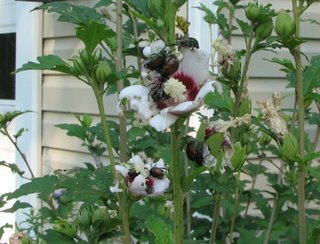 Those bags you get to hang up in your yard have that in them so they attract Japanese Beetles to the area. We promoted the info to our neighbors that they are now NOT recommended because they create a worse problem. I haven't seen any of those hanging in the yards of our close-by neighbors, so I'm sure that has helped also. 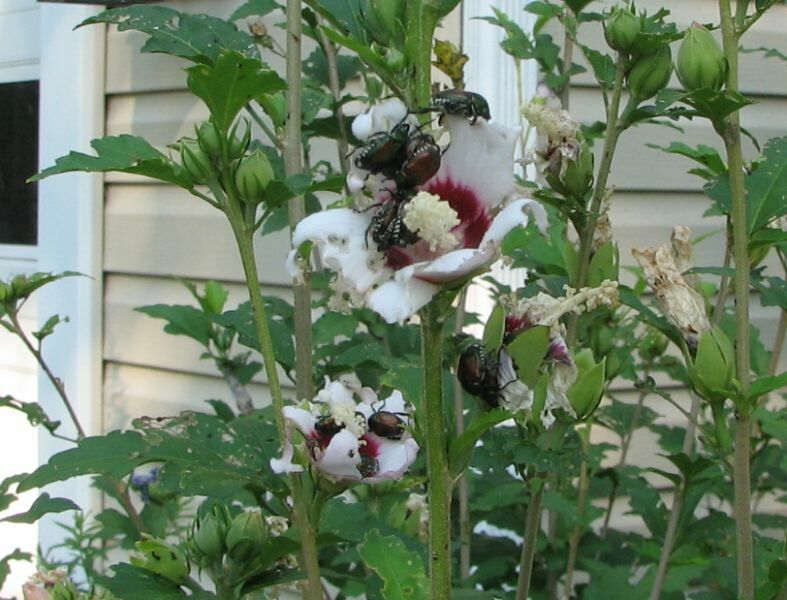 Here's some info from Perdue University: "Avoid Japanese Beetle Traps: There is no doubt that Japanese beetle traps catch large numbers of beetles. However, they usually do not reduce damage to plantings. Research has shown that these traps attract many more beetles than are caught. Therefore, susceptible plants along the flight path of the beetles and in the vicinity of the traps are likely to suffer more severe damage than if no traps were used." Chickens really love Japanese beetles! You can catch the beetles easiest in the evening, when it's a bit cooler and the beetles are slower. Use a jar containing ice cubes and tap the beetles off leaves into the jar. The ice slows them down even more. When you're done, offer the sleepy little things to your chickens, ice cubes and all. That's a great idea, Randi! I did the soap thing one year and felt so guilty. Am glad I found out the birds will take care of them. We have a lot of birds since we've been feeding them and creating habitat for them since we moved in here in 2000. Lots of new babies coming behind .... especially right now. I love it! What Are You Stumbling Over?